SHS Hoof Wraps are a Hoof Protection System that rolls onto the hoof then sets hard and fast within minutes. They are made of a Wide Open Weave Poly Stretch Knit Fabric that allows the hoof to sweat and breathe naturally. Unlike generic medical human fiberglass casts, SHS Hoof Wraps are designed to stretch to a fully loaded hoof, creating a custom fit for each unique hoof. SHS Hoof Wraps create a layer of protection and support for the walls and sole. Each wrap creates a unique hoof orthotic supporting the hoof walls both vertically and horizontally. When properly applied, these wraps will not rub or constrict the hoof. SHS Hoof Wraps Go through Water and Mud. SHS Hoof Wraps work over a Horseshoe, Under a Horseshoe or on a Bare-Hoof. HRSHW2 Steward Hoof Wraps 2" x 4 Yards - 1 Pkg. 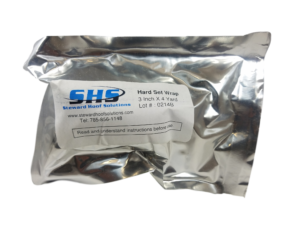 HRSHW3 Steward Hoof Wrap 3" x 4 Yards - 1 Pkg.